Fairview Christian Church is available for weddings. We have a sanctuary with a long center aisle and seating for approximately 360 people. 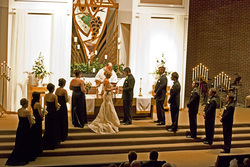 We have a chapel for small, intimate ceremonies. 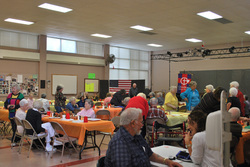 We also have a Fellowship Hall with a stage area with table seating for approximately 150 people. For more detailed information contact Kathy in the church office. The sanctuary is large enough for a pretty large wedding party. A piano and organ are available in this setting. As the next photo shows there is a long aisle for the bride to walk down. The chapel could be used for a small intimate wedding with seating for about 60 people. Here is a representative gathering in the event you would wish to have a small reception immediately after the ceremony. Fellowship Hall can seat about 150 people. A stage area is available for live music.